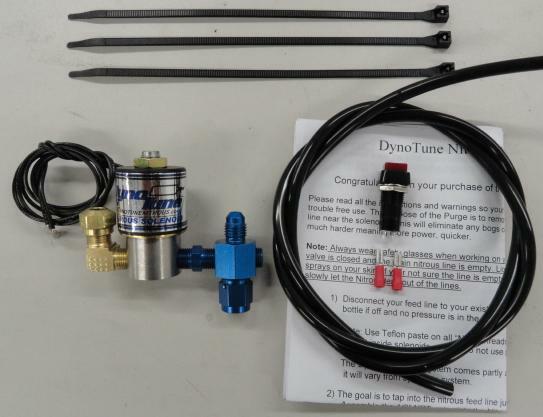 DynoTune Nitrous Purge systems Perform!! !This nitrous Purge System bleeds the air from the Nitrous line while also sending a plume of Nitrous high into the air. It has the standard feed line 4AN or 6AN input and is compatible with all nitrous systems. It comes with complete instructions and the nitrous Purge system kit is made of superior components including a stainless steel high flow Nitrous solenoid(same as in our nitrous kit), fittings, Momentary switch, tie wraps, adaptors and enough Purge tubing to mount it just about any location. A nitrous oxide purge is a great addition to any nitrous system.